Grade 8 students Christine Mosby (Lower Mills Campus) and Brianna Gomez-Pena (Neponset Campus) have been nominated for a prestigious scholarship program for students entering select Catholic High Schools in the Archdiocese of Boston. 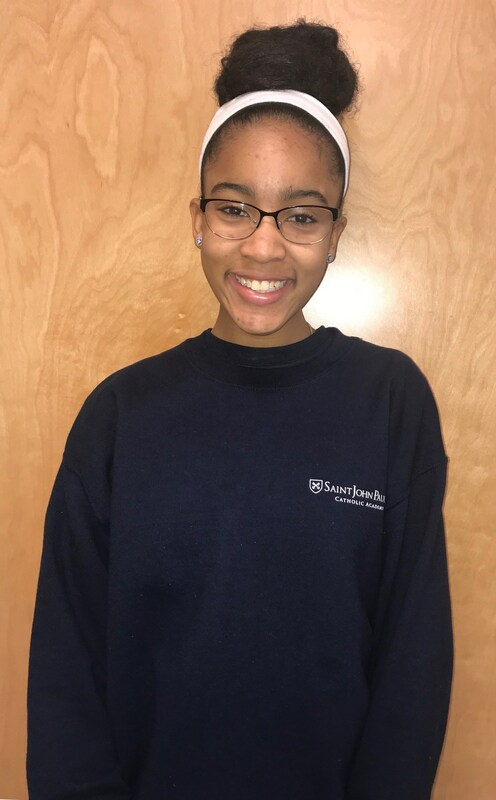 Saint John Paul II Catholic Academy 8th graders Christine Mosby (Lower Mills Campus) and Brianna Gomez-Pena (Neponset Campus) have been nominated for a prestigious scholarship program for students entering select Catholic High Schools in the Archdiocese of Boston. Through a partnership between the Catholic Schools Foundation and the Gerstner Family Foundation, scholarships will be guaranteed for four years if students continue to meet all requirements. Recipients are nominated by their elementary school principals based on academic achievement, demonstrated leadership potential and dedication to community involvement. A committee reviews all applications and finalist nominees participate in a personal interview. Christine and Brianna were selected as two of twelve finalists for the competitive scholarship. Gerstner Scholars in the Class of 2022 will each receive scholarships for $6,500 in the 2018- 2019 school year. In 2015, The Gerstner Family Foundation, founded by Louis Gerstner, Jr., former Chairman of the Board and Chief Executive Officer of IBM, granted the Catholic Schools Foundation $500,000 for this program with the goal of strengthening the transition between Catholic elementary and high schools for high achieving students.